He’s two years old TODAY. I can’t believe it! Time is going faster and faster as more years go by. When I was sharing a story about him recently, I got some questions about what exactly my role is as godparent. In the Catholic Church, being a godparent is centered around helping a newly baptized child or adult in their spiritual life. There’s no formal checklist of tasks that a godparent must do (but I do like this article’s suggestions), and the relationship can look different from person to person when you get outside of the fundamental core of helping them grow in their faith. Checking out the elephants during his birthday trip to the zoo today! Squeaks, we love you buddy! I have some pretty fabulous friends. Some I’ve known since I was a kid, some since high school or college, and others I’ve met further into my adult life. Some of these friendships have been constant smooth sailing while others have had their bumps along the way. But people who are truly meant to be in your life always end up back beside you, even if you drift apart for a bit. My great uncle, Father John Kilcoyne, was a truly wonderful guy. A fabulous priest and a dedicated family man with a kind heart and a great sense of humor, he impacted the lives of countless people and is greatly missed. Thou shalt be loyal to family, friends, and faith. 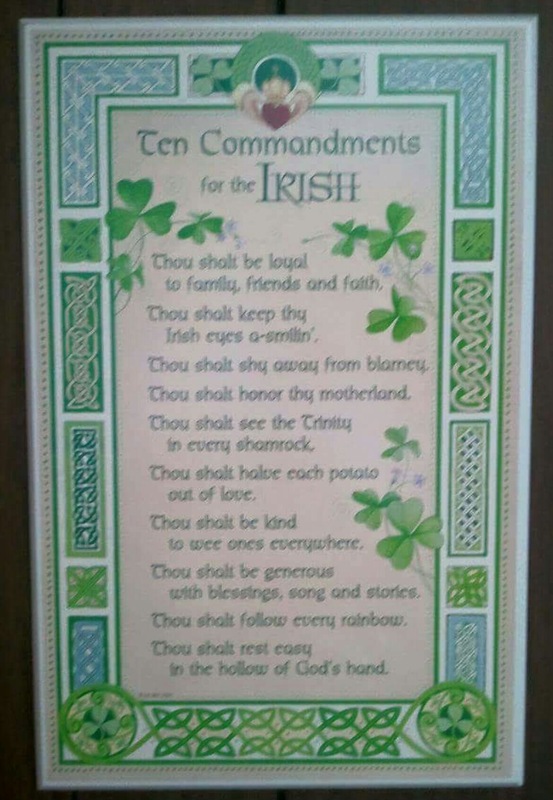 Thou shalt keep thy Irish eyes a-smilin’. Thou shalt shy away from blarney. Thou shalt honor thy motherland. Thou shalt see the Trinity in every shamrock. Thou shalt halve every potato out of love. Thou shalt be kind to wee ones everywhere. Thou shalt be generous in blessings, song, and stories. Thou shalt follow every rainbow. Thou shalt rest easy in the hollow of God’s hand. The song debuted last October, but the music video just came out a few days ago. It’s directed by Derek Hough, who stepped in to assist with production of the video while Michael Buble is caring for his child who is battling cancer. According to an Entertainment Tonight article, Hough’s grandparents inspired the music video’s emotional love story, which features romantic dance sequences. “My grandfather passed away last year and the last couple of years they danced every single morning together — my grandma and grandpa,” Hough shared. “They danced every single morning to the same song, and it was their ritual. Even the night before he passed, they were dancing together, and then he passed away that night. For me, that was like this beautiful story of everlasting love, and that’s kind of what I wanted to tell.” I mean…I can’t even! While there’s the obvious application of its meaning and lyrics to a romantic relationship, I do think that a lot of this song’s elements can also be appropriate for non-romantic scenarios, too – having to start fresh sometimes, believing in one another, being the light for and loving each other. Enjoy the music video and lyrics below! It’s easy to forget – or not realize – how much a kind word or action can mean to someone. It doesn’t matter how much time has passed since you’ve spoken to someone or heck, with technology these days, if you even know them. If you feel the urge to reach out, go ahead and do it. Even if you’re not sure if you should, or you don’t know how it will be received, do it anyway. I can pretty much guarantee it will be appreciated in one way or another. Kindness matters. Kindness is important. And kindness will always matter and be important. Here’s an example…. There’s a gal I went to high school with that has been struggling with starting a family for the past few years. We were never really close, but we always exchanged a hello and a smile when we passed in the hall or had a class together. She’s shared her experiences publicly on Facebook, and while I don’t honestly remember what finally made me think, “gosh, I want to send her a message and let her know I’m thinking about her and praying for her”, I did it. Despite all these questions in my mind, I did it, and I’m SO GLAD I did. She told me that the messages she’s receiving from everyone that’s reached out were carrying her through moments when she didn’t feel she could go on. By sending a simple note letting her know I was thinking of her and appreciated her sharing her story. Simple words and actions can have a big impact, people. Never forget that. We’ve exchanged several messages back and forth since last summer, and I’m so glad we’ve reconnected a bit. After losing several pregnancies in a very short amount of time, she and her husband conceived naturally and are expecting their rainbow baby! I am so happy for that sweet little boy. He will be so very loved and already has the greatest parents. You see, just a few weeks prior to seeing that list, my husband had returned from safari in Africa. He and his business partner got some AMAZING photographs of elephants, so I thought it might be cool to see if she wanted a couple prints to possibly use in some way for the baby. I share this story not to say, “hey, look what I did”. That’s not my style and never will be. Rather, I share this story to simply provide an example that small actions can mean the world to people, even if it’s been years and years since you’ve spoken or seen them. If something in your gut is urging you to reach out to someone, do it. You may or may not know the full impact it will have on that person, but it. will. mean. something. It could simply brighten someone’s day, or in some extreme circumstances it could end up saving them from harm. Spread the happy, the kindness, and the love, folks. Always.